Why should movie-goers have all the 3D fun? They won’t any more; now American DJ brings 3D excitement to small clubs and weekend wedding gigs with its breathtaking new Royal 3D Laser Effect. 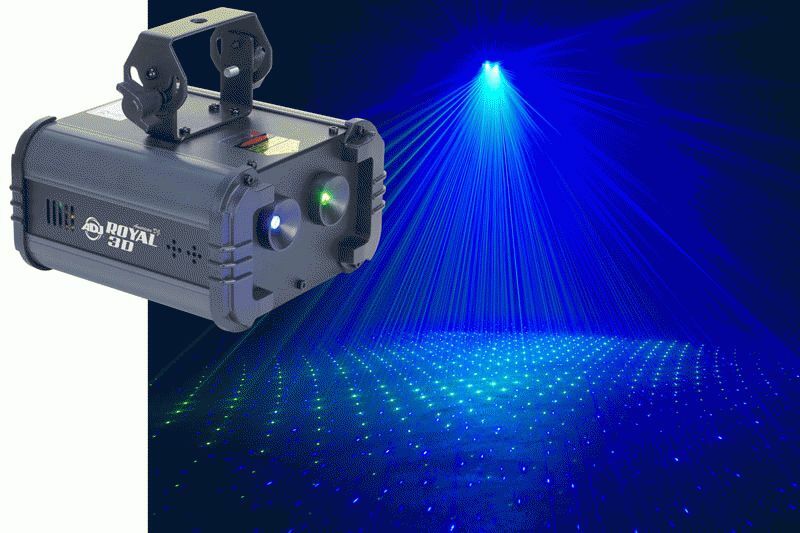 The groundbreaking new fixture adds a whole new dimension to affordable lighting with green and violet blue laser beams that dart across dance floors, walls and ceilings to create a multi-dimensional feeling that will sweep audiences off their feet. The rotating lasers of the Royal 3D perk up every corner of the room with luxuriant, dazzling color, thanks to the unit’s incredible 90-degree beam angle that allows the beams to wash the entire area with its intense color and striking patterns. The effects are so brilliantly breathtaking it’s hard to believe that it all comes from just two FDA-approved (USA) lasers – one 30mW green and one 350mW violet blue – that work perfectly in tandem to create an awesome shower of light. Although it’s compact and lightweight, the Royal 3D packs a powerful lighting punch. The Royal 3D can operate in DMX mode or by utilizing it’s 15 built-in patterns in sound active mode. Mobile DJs and small clubs can simply plug-in this user friendly unit to launch a laser show that will WOW any crowd. As if that weren’t enough, the Royal 3D features a heart stomping strobe effect in addition to its traditional laser beams. For added impact, multiple units can be linked via DMX or Master/Slave mode and sound active mode. The Royal 3D is linkable via 3-pin XLR connectors and IEC in & out to daisychain power which allows up to 14 Royal 3D’s to be connected for a truly exceptional laser experience. The Royal 3D unit itself is attractive, compact and lightweight, yet built for life on the road with durable metal housing that features bumpers on the corners and edges to protect the user’s investment. The four-button digital DMX display enables users to toggle through the five DMX channels – blue laser, green laser, rotation 1, rotation 2 and macros. The Royal 3D works its way through its extraordinary patterns with fluidity thanks to 1.8-degree stepper motors that give it smooth, seamless movements. For convenience, the Royal 3D has a 1/4” input for operation via a UC3 remote control (sold separately). The low, 24W power consumption makes this powerful and dramatic effect very economical to use. The Royal 3D is 8.75” x 8” x 7.75”, weighs 7 lbs. and comes with a sturdy hanging bracket and a safety hook on the back for added security. It has multi-voltage capabilities (AC 100-240V, 50/60 Hz) through an IEC plug. MSRP is $899.95.